The “Olympic Casino Flair Mania 2014” competition was held on January 16th 2014 at “Olympic Voodoo Casino“ in Radisson Blu Hotel Latvija, 55 Elizabetes street in the city of Riga, Latvia. 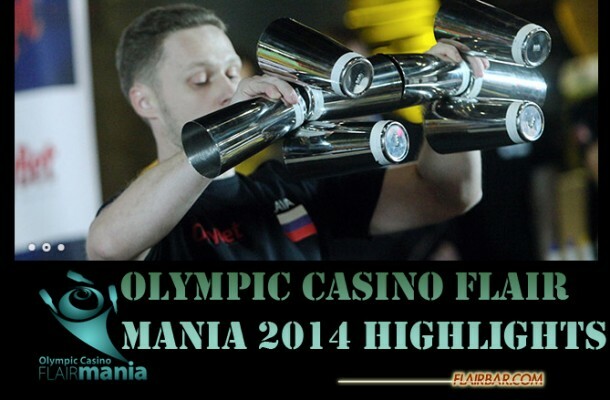 “Olympic Casino Flair Mania 2014” is a part of World Flair Association’s Grand Slam 2014. Olympic Casino Flair Mania 2014 had a qualification round and the finals. Time limit was 4 minutes for the qualification round and 6 minutes for the finals. Each participant had to make 2 cocktails. One is to be done using working Flair technique and the other – using exhibition Flair technique (drink recipe regulations are provided further in the rules). General sponsors of the event were “Olympic Casino Latvia”. Supporters – “Monin”, Latvian Bartenders Federation, bartending.lv. For those of you who missed this event… Here are some of the highlights from this well executed event. I don’t know about you… but I’m definitely looking forward to this event next Year! For more info on the event you can CLICK HERE!